Will a proposed expansion of the Air Force’s Nevada Test and Training Range wipe out projects vital to economic development in Beatty? Will it close off popular areas locals routinely use for recreation? 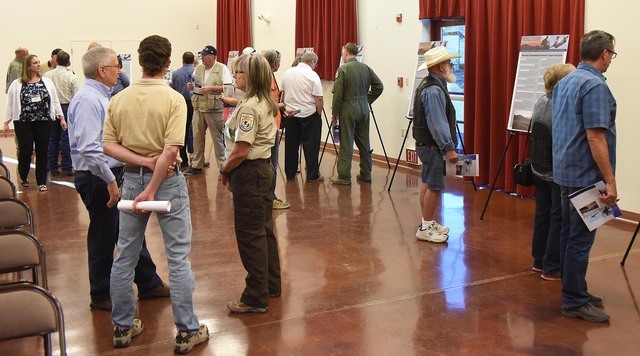 Those were among the questions on the minds of Beatty residents who attended the Air Force’s scoping meeting at the Beatty Community Center on Oct. 12. Facing persistent enemy threats that include ISIS, Air Force representatives during a Beatty visit pushed for a plan to expand the Nevada Test and Training Range by more than 300,000 acres of public land. Plans include 17,960 acres northeast of Beatty. Resident David Spicer was concerned that the land withdrawal could close much of his successful mountain bike trails project, especially the Transvaal trail. Karl Olson feared it could close off the route of the educational geological and historical tours that he has worked hard to develop. These routes are used for the annual VFW poker run, and it is hoped that publication of the maps and guide books will make them a year-round attraction. Spicer also mentioned that it could also put an end to the Best of the West off road race coming through Beatty. Bobby and Ann Marchand mentioned that they are among the locals who regularly off-road in the Beatty Wash, which could be closed. Residents of Oasis Valley were concerned about possible impact or encroachment on their property. One thing everyone seemed agreed on was the need of a larger scale, more detailed map. The current withdrawal agreement is due to expire at the end of 2021, and the Air Force is considering several options, deciding what to present to Congress as a request or proposal. The final decision rests with Congress. 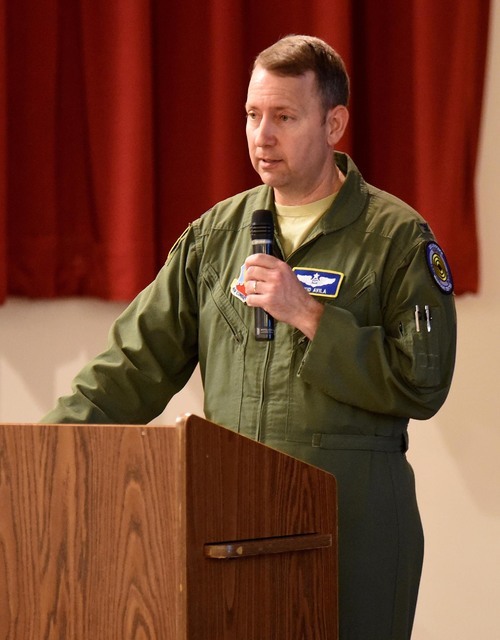 Air Force representatives, including Col. David Avila, commander of the Nevada Test and Training Range, and a video presentation, laid out the military need for expansion of the range. They said that new “5th generation” aircraft and the development of longer-range enemy weapons make it difficult or impossible to duplicate real-world battle conditions. Distance and access restrictions, particularly in the Nevada Test and Training Range Southern Range, put a hamper on replication of real-world tactical maneuvers. They also cited the need for increased safety buffer zones. Tonopah resident and former Bureau of Land Management field supervisor Tom Seely said that he had recommended that the withdrawal near Beatty be dropped because the combination of the withdrawal and local topography would put the squeeze on development in Beatty. As evidenced by the fact that the Congressional decision is expected near the end of 2021, this is a slow, deliberate process, and nothing is set in stone. In fact, Air Force representative Jim Sample, from Washington, D.C. said, “It is very Jello right now,” later adding that Jello might be too firm a description. Concerned parties have until Dec. 10 to submit comments. They can be sent to Nellis Air Force Base, 99th Air Base Wing Public Affairs, 4430 Grissom Ave. Suite 107, Nellis AFB, NV 89191, or submitted online at 99ABW.:PAOutreach@us.af.mil. There will be another public review of the draft proposal between January and March of 2018. This Air Force process is separate from a similar one being conducted by the Navy for its Fallon Range.